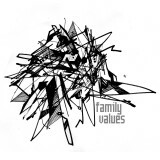 Tis also the season for Vakant the label, the mythos, the family to reunite and drop the blazing ‘Family Values’ compilation for your late summer revelry. The unmixed compilation starts off with our distant Argentinean cousin Nico Purman. His ‘Xpress Yourself’ lands somewhere between Rick James and Francois K. Second is bro wonder Tolga Fidan who continues to impress with his ‘Linnz’ contribution. Not one to leave all the fun to the kids, Godfather Alex Smoke (VA001) gives his army of robots free rein and out the other end comes ‘I-73 Nightʼ, freaky yet reassuring like advanced techno should be. Rounding out the first half is our other prodigy DeWalta whose favorite pastime happens to be breaking subwoofers. His deep yet bouncing ʻStringer Bellʼ is sure to result in a run on replacement woofer cones. The wise and the freaky family elder Robag Wruhme (VA002) bestows upon us ʻKuttenrolch 1996ʼ, a light and airy electro tinged piece produced solely on a Korg Trinity in 1996 while sounding just as fresh as if produced yesterday. Next up is visiting uncle by way of marriage Anthony Collins who imparts ʻBoys Sometimes Cryʼ showing his depth, musicality, and maturity. Then everyoneʼs brother Mathias Kaden presents us with a 2010 edit of his own first ever solo release, ʻCircle Pitʼ (VA004) which is as sick as the original was in 2005. Finally comes our Bavarian son Dario Zenker who puts a big red ribbon on the ʻFamily Valuesʼ package with perhaps his slickest, sexiest, and expansive track to date with ʻApollo 910ʼ. So enjoy the Vakant familyʼs tech house fruits, partake in its freaky family love, but please try not to get burned.